I hate you messages for her: You will be able to relate to these quotes if you hate your ex-girlfriend or ex-wife for cheating on you, betraying your trust and breaking your heart. Make your hurt known to her by sending angry text messages, funny Facebook posts, sad Pinterest pins and emails. There is no place for lies, deceit and cheating in love and if your ex has broken your heart, you have the right to let her know the pain and suffering that you are going through. Don’t do this with the intention of insulting her or getting revenge. Because one day, life will come a full circle and karma will show her how it feels to be heartbroken. 1) I would rather waltz with the devil of loneliness than tango with a devil like you. I hate you. 2) The system of my life got infected with a virus called You which corrupted my memory, deleted my emotions, formatted my feelings and spammed my heart with hate. I hate you. 3) It is easy to describe our relationship in accounting terms: The cost of being in love has become a big expense to me after a girl like you broke my heart. But a lifelong liability, depreciating self-respect and negative goodwill is the price you will pay for breaking my heart. 4) The funny thing about our breakup is that I always thought that you were cheating on me. But I allowed my heart to convince my mind into believing otherwise. I hate you. 5) Happiness is indeed, a very relative concept. I found my happiness in giving my love you to, while you found your happiness by being in another man’s bed. I hate you. 6) We both wanted happiness. But the only difference between me and you is that I was seeking happiness by making you happy, while you were seeking happiness by making another guy happy. I hate you. 7) Now I understand what was happening when we used to kiss. I felt alive when you kissed me but you were actually sucking the life out of me. I hate you. 8) You left me for a guy because you preferred money over love. I can’t wait for the day when that guy leaves you, because he preferred love over lust. I hate you. 9) You cheated on me, lied to me and broke my heart. What did I do? I just called Karma and gave your address. I hate you and I hope Karma gets to you soon. 10) I don’t hate you just because you broke my heart. I hate you because you trampled all over it, punctured it and left it to rot in the ugly world of loneliness. 11) Some people lie, some people cheat. Some people are manipulative, some people are evil. Some people betray, some people break hearts. You are truly an all-in-one since you are a liar, cheater, manipulative girl who did an evil thing by betraying me and breaking my heart. I hate you. 12) I always believed in true love, until you dumped me with your cold heart. Thanks for debunking a myth, but I hate you. 13) Now I realize why you put on such a flowery rosy fragrance every day. You just wanted to hide the ugly thorn that you really are. I hate you for dumping me. 14) We had common dreams of sharing a home and sharing a bed with our life partners. I just didn’t know that you wanted to share such dreams with more than one man. I hate you for cheating on me. 15) I always considered myself to be very lucky to be married to such a beautiful wife like you. Little did I know that your beauty was just a mask to hide your ugly intentions and manipulative actions. I hate you. 16) I don’t hate you for never liking me. I hate you for pretending to like me when you liked someone else all this time. 17) Do not trust, do not love – This is a warning sign that girls like you should have on your heads. I hate you. 18) I could have tumbled down the stairs or fallen off from my bike, then I would have got scars that everyone could see. But since I tumbled in your trap and fell into love, I have got scars that no one can see but only I can feel. I hate you. 19) The way you cheated on me taught us both many lessons. If we look in the mirror, we will both see stronger versions of ourselves. I am a stronger person, you are a stronger devil. I hate you girl. 20) You must tell me your secret to good sleep. How do you manage to sleep peacefully every night despite knowing how ruthlessly you broke my heart by getting into bed with another man? I hate you. 21) Thank your luck that Facebook doesn’t have a hate button. If it did, I would click on it every single day and share it on Twitter too. I hate you. 22) Do you know the real meaning of the world Selfish? Take a look into the mirror and you will find out. I hate you. 23) You said you loved to me, but you cheated. You said you wanted to be with me, but you lied. You should change your name to Miss Cheating Liar. I hate you. 24) When we were in a relationship I told you that there are millions of reasons why I loved you. Now that you have cheated on me, the same millions of reasons have become reasons to hate you. I hate you. 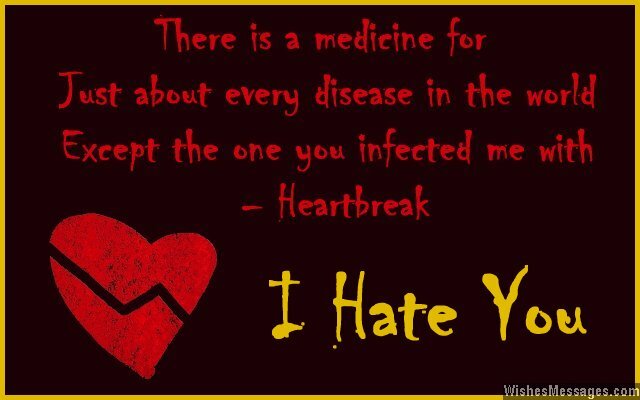 25) There is a medicine for just about every disease in the world, except the one you infected me with – heartbreak. I hate you. 26) Even though you slept with another guy behind my back, I will never even try to teach you a lesson. Because if I do, I will have to become like you – heartless. I hate you. 27) I fell for you when we met for the first time at a party and you started kissing me. It is a pity I was too innocent to understand the difference between Love and Lust. I hate you for cheating on me. 28) I will never delete your number from my phone book. After all, you never know when you will need the Devil’s help. I hate you girl. 29) Cheating, betrayal, lies, deceit and heartbreak – you may get a rush from doing all these things to others, but I hope you remember life’s most important lesson – what goes around, comes around. I hate you. 30) While I wonder what I have done to deserve being cheated on and betrayed, I want you to wonder what you will deserve in the future because of your evil actions today. I hate you.